Sheree Rodgers, RN, BSN, checks Laurie Anne Price’s vitals at the Neurology Intensive Care Unit at the Center for Care and Discovery. As nurses at the University of Chicago Medicine continue to exemplify and strive for excellence in patient care, the Peer Review program established in 2016 is promoting deeper collaboration while sharpening an even greater focus on professional development and patient outcomes. 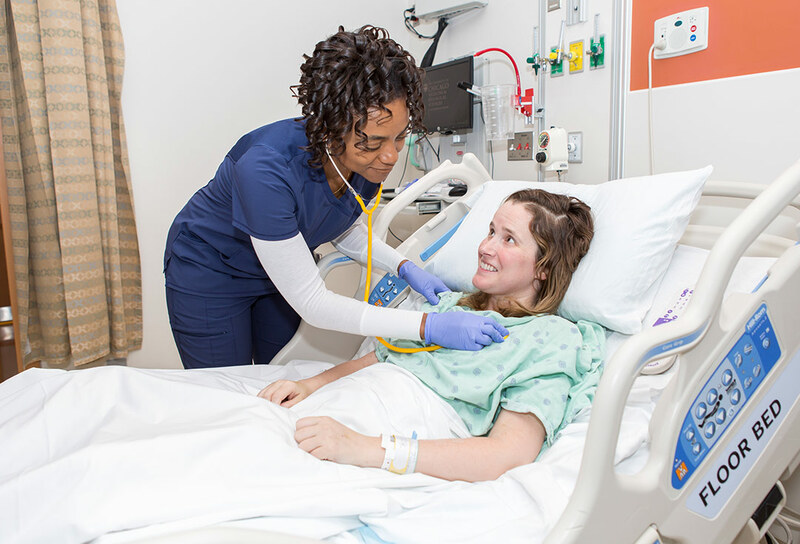 Following copious research and planning by a task force of 58 nurses, more than 2,000 hospital nurses received thoughtful and forward thinking feedback from their peers in a program implemented in 2016. This year, the task force plans to evaluate the program and plan improvements as well as complete another round of peer review from June through October. Senior Vice President of Patient Care Services and Chief Nursing Officer Debi Albert, MSN, MBA, RN, NEA-BC, is impressed with the work accomplished by the group, as well as the results. “For me the best part of that is not only is it modeled after our professional practice, but after we did this the nurses came back and said what a positive experience this was and how it really drove their clinical practice forward,” Albert said. A panel of reviewers expressed greater respect for their colleagues, and nurses say they appreciate being recognized for the work they do. Sheree Rodgers, BSN, RN, a staff nurse in 8 North, Neuro ICU, was part of the development and implementation of Peer Review. And, like all UCM nurses, Rodgers received feedback through the process as well. Twenty years into her career, Rodgers says the review added fuel to her passion for her work. “My desire to teach and help patients and my colleagues has only grown stronger as the years of my nursing career progresses. I was honored to be involved in the development and implementation of Peer Review. This experience challenged me to assess performance honestly and without bias. It was gratifying to hear what my coworkers thought of my performance as a nurse. I also saw it increased morale and celebrated nurses for their accomplishments,” Rodgers said. Rachel Peterson, MSN, RN, CCRN, a staff nurse on 3 East North in the Surgical Intensive Care Unit, also found value in the process. 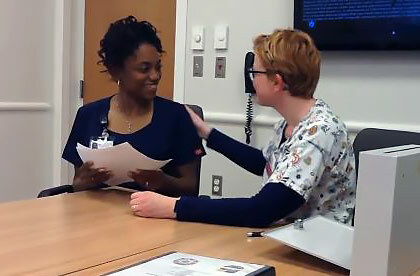 In the program, nurses choose their peers to serve as panelists via a confidential survey. The panelists then learn best practices for conducting the reviews. 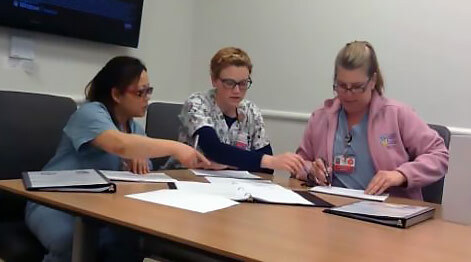 Each nurse responds to self-evaluation questions, which are then reviewed by typically three panelists, the only ones who have access to the nurse’s review. Questions center on a nurse’s skills at contributing to evidence-based practice, promoting collegial relationships, advancing the community’s health and well-being, and providing patient and family-centered care. The panelists meet individually with their peers to talk about their strengths and offer suggestions for improving professional practice. Before creating the program and training nurses, the task force researched the literature on Peer Review to learn how it’s done, why it’s important, what works and what doesn’t. “We found a great deal of evidence that peer review can create more collegial relationships and enhance patient care,” said Donna Kahn, BSN, RN, staff nurse leader for the Peer Review program. Panelists encourage nurses to continue focusing on patients and their safety, and seek national certifications within their specialties. These certifications keep nurses up to date on the latest evidence based practice recommendations in patient safety and clinical care for their specific patient population. Through confidential reviews, the panelists can praise the nurse for his or her clinical skills, and then mention how the team is working to decrease infection rates, suggesting how she could help.